Lucky Charms – My daughter is a freak for Lucky Charms and she got that from me. Lucky Charms is a no-brainer in the HD household, but my daughter has caught on that she loves the marshmallows so much that she leaves the rest in the milk to soak and get soggy – big pet peeve of mine! 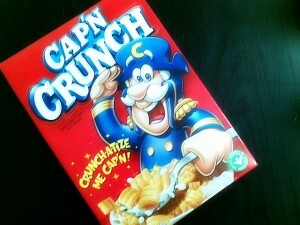 Cap’n Crunch – This has many variations to it, but I’m a big fan of the original Cap’n Crunch. If I were to have to pick one of the other kinds, it would be the Peanut Butter in a heartbeat. I am not going to give the little princess these, but this is strictly for HD – and believe me I crush them any time they make their way home from the grocery store. Trix – This fruity cereal is great for both adults and kids. Heck, the slogan is “Silly Rabbit, Trix are for kids.” I grew up eating Trix so I’m biased, but I haven’t gotten my daughter hooked on it yet. Don’t get me wrong, she likes it, but she is still a sucker for Lucky Charms any day. Corn Pops – The best thing I love about Corn Pops is that you can eat them with or without milk. I bet I’m 50/50 on the number of times I just eat Corn Pops by themselves, in all honesty. My little one hasn’t ever eaten them, but my wife is a big fan as well on these. Needless to say, they are a staple in the HD house. Raisin Bran – Yeah, this is probably coming from left field considering it doesn’t have the sweet or fruity taste of most cereals, but for whatever reason I’m still a huge fan of Raisin Bran. One thing you can’t do though is let this cereal soak in milk. I love it when it is crunchy, not soggy. That’s my tip for the day.